Because its both fun and powerful. I truly believe that volunteering is an important cornerstone in belonging within a community, not just inhabiting it. If I have a chance, in whatever small way, to help out someone who is going through some hardship, then that is a brilliant use of my time. Specifically for the Mountain Haven program, I love volunteering there because you can really see the impact that happens over such a short weekend with both the women and kids that come through the program. Camp Chief Hector, simply due to its location in the beautiful Rockies, provides a safe space that is different enough from the everyday that people have the chance to explore parts of themselves that are just out of the their comfort zones. The women and kids that the program works with are survivors of domestic abuse, and have been through a lot to get to the shelters. I hope that by realizing at camp that they are able to do something they were initially afraid of, that they can realize that they might just have the strength to pursue something that they are currently afraid of in other parts of their lives. It’s truly a humbling and inspiring experience to be a part of that realization. The human connection has to be my favorite thing about volunteering. I really love connecting with the woman, kids, and all the YMCA staff as we go through this transformative weekend together. Each weekend is unique in the different set of personalities and experiences that each group brings, which always keeps things interesting. It’s really fun for me to have the chance to explore a different set of ‘soft skills’ than I would normally be using in my job as an engineer. One of my favorite memories of Mountain Haven has to be a weekend where the shelter brought back some of their ladies that had successfully transitioned from the shelter to partake in the weekend alongside the rest of the shelter. Some of these ladies I had worked with in years past, and it was such a powerful weekend to be part of the conversations and realizations as the women in different stages of their journey after domestic abuse talked about the hope that comes after, and how things do get better. There was a lot of strength in that room. 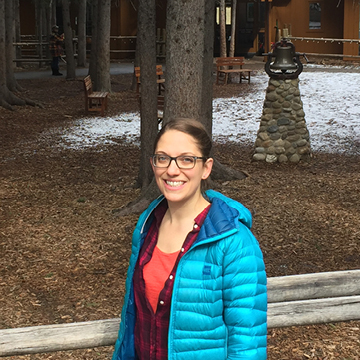 I started volunteering with the YMCA when I was in Grade 12 in 2005, after a couple of my friends had volunteered with the Calgary Board of Education Outdoor program at Chief Hector and convinced me to come along. I had been to camp in Grade 5 and 6, really enjoyed it, and thought it would be fun to help out facilitating that program on the staff side of things. I really enjoyed my experience working with that Outdoor school program, and when my Science teacher (who was a Mountain Haven volunteer at the time) said that they were looking for volunteers to help out on the weekend in a different sort of program, I jumped on the chance. The rest, as they say, is history – I think I’ve been volunteering with the YMCA Mountain Haven program every year since then.